Malabar Hill, India submitted to ‘Unsung Hero’ on National Geographic. Kristian Bertel has contributed to the National Geographic Your Shot community with an assignment called ‘Unsung Hero‘. For this assignment curated by Matt Moyer, a National Geographic photographer wants us to photograph the heroes in our lives. We should think about who our heroes are and more importantly, why they are our heroes. The persons who lift us up, inspire us, protect us or even save us. But our heroes cannot only be meant as a person like our parents it can also be concepts. As Matt is saying it: ”- My teacher who first suggested I give photography a try and he changed who I was going to be and inspired the life I would go on to lead. Share photographs that communicate how you feel, and use your captions to help us understand why you feel this way. I look forward to being inspired by your unsung heroes”, he says. With the photographer’s submitted photograph for this assignment he respectfully wants to tell heroic story of being yourself in India or in the world. The photo of a sleeping man at the self is shaped by our social interactions and our physical environments. An individual’s social interactions occurs when they’re in a specific society or culture. If these individuals grow up in a certain culture they’re going to conform to societal norms and pressures to follow a specific standard that their culture believes in. This is why culture is important to study and explore when searching how the self evolves and changes. To conclude, western cultures are more self-absorbed in their own lives whereas eastern cultures are less self-absorbed because they cherish the collective. The self is dynamic and complex and it will change or conform to whatever social influence it is exposed to, because it always looks for reason to not be harm. Being yourself and sleeping on a bench is much about self-esteem that describes how a person evaluates their self positively or negatively. Four factors that contribute to self-esteem are the reactions we get from other people, how we compare people to ourselves, social roles, and our identification. These roles might be stigmatized as being negative, such as a homeless person. People with high self-esteem view their selves as containing positive traits. They are more willing to take more risks and aim for success. People with high self-esteem tend to be confident, gain self-acceptance, do not worry as much about what others think about them, and think more optimistically. In contrast, people with low self-esteem view their selves as containing few or no positive traits, rather than viewing their selves as containing negative traits. It is rare for a person to rate their overall self as being terrible. People with low self-esteem typically do not wish to fail and worry what others think about them consistently. 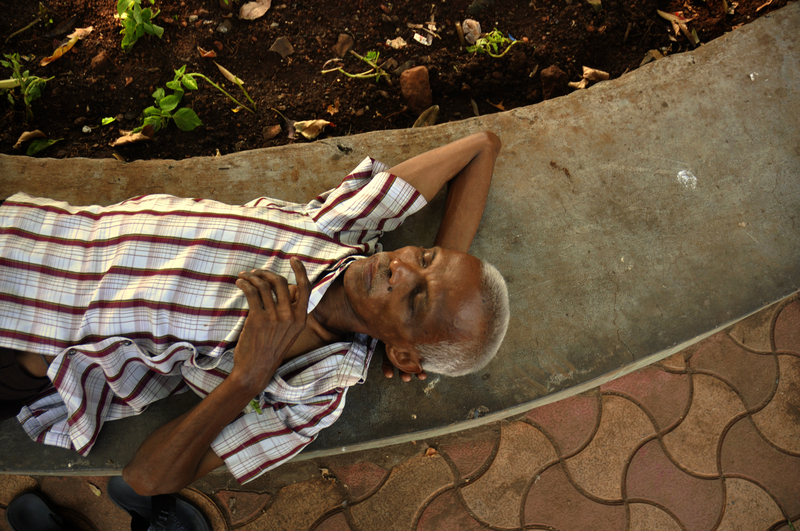 ”- As a traveling photographer I came across this man who was sleeping on a bench in the Hanging Gardens in India. The Hanging Gardens in Mumbai, also known as Pherozeshah Mehta Gardens, are terraced gardens perched at the top of Malabar Hill area of Mumbai, India”, the photographer Kristian Bertel says. This terraced garden was built in 1880 and later renovated in 1921. This renowned garden located on the Malabar Hill is known for its splendid green vegetation and animal shaped hedges, which is an interesting sight for anyone who visits this spot. Adding to the garden’s beauty is the comforting view of the vast Arabian Sea. Watching the sunset from the Hanging Gardens would provide you with an experience worth remembering a lifetime. One interesting fact about Hanging Gardens is that it is built on a water reservoir, which provides fresh drinking water to the locals who live nearby. Varieties of plants and flowers can be seen within these beautiful gardens. A large number of tourists to Mumbai never forget to visit the beautiful Hanging Gardens. Built on a water reservoir, the Hanging Gardens covers a vast area, which is chockfull with green bushes, trees and animal-shaped topiaries. The striking flower, clock situated in the center of the garden, serves as the main attraction for all tourists. The garden is maintained perfectly and one can spend an entire day exploring the natural beauty of these terraced gardens along with family and friends. You can also watch a glorious sunset from these gardens and it is also a great place for early morning jogs and yoga as the air is clean and fresh.